In mixer bowl cream butter and sugars until fluffy. In another bowl combine flour, baking powder and salt. In measuring cup combine milk and maple flavoring; beat into butter mixture alternatively with flour mixture. Beat in eggs 1 at a time. Mix in 1 1/2 cups chopped walnuts. Turn into greased 9 or 10-inch tube or bundt pan. Bake in lower third of 300º F (150º C) oven 1 hour to 1 hour, 15 minutes, just until pick inserted into center comes out clean. Cool in pan 15 minutes, then turn out onto rack to cool completely. 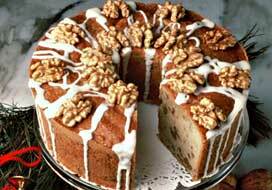 Drizzle with maple glaze and garnish with walnuts. In a small bowl mix 1 cup sifted powdered sugar with 1 to 1 1/2 tablespoon milk to make a glaze of thick pouring consistency. Stir in 1/4 teaspoon maple flavoring or extract. This recipe is very easy, and great for beginner bakers like myself. My entire family loved it! I'm a bit confused on what to use in place of maple extract/flavoring for the glaze. Could not find where to purchase it so i used almond flavoring. I'm sure it would have been better if you could put something with the recipe as a substitute. Thanks alot. I just love the flavors of this cake. The maple just makes the cake so powerful and full of a warm buttery flavor when you bite into it. My father is not a baker but he said he can make this dessert any day.